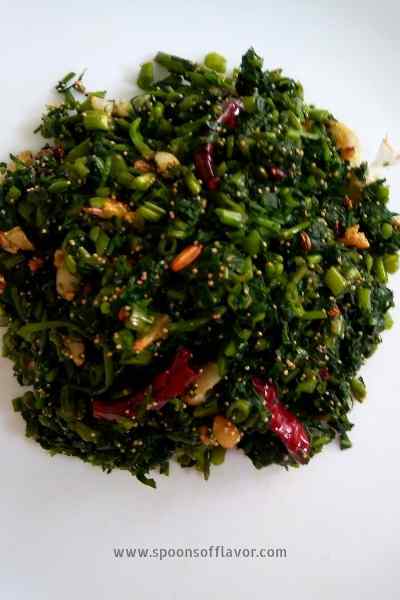 Kalmi Shak Bhaja/ Kolmi shak/Stir-fried Water Spinach is a light and delicious recipe. I remember in my childhood days this is the particular shak I used to insist on my mother to make in summer. As in summer, the young tender shoots arrive in the market. And they taste awesome. 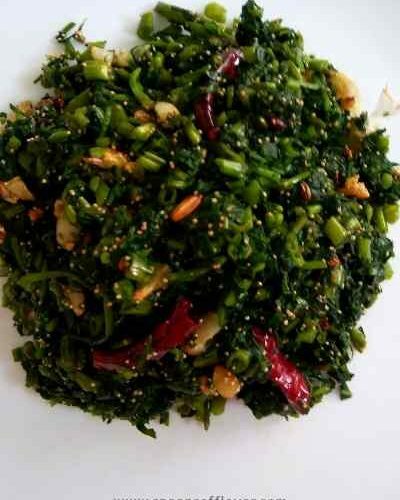 Kalmi shak/water spinach/river spinach is popular across the world. And often considered as a healthiest leafy vegetable packed with nutrients. Such as iron, phosphorus, vitamin A, vitamin B, vitamin C, and fibres. Its water content is very high and is good for people with constipation and liver problem. It can naturally grow on moist soil or in water and is cheap and easily available. The kalmi shak itself has a nice, crunchy taste. Hence there is no need to add various spices to it. It is just a good side dish goes well with plain rice and daal or any other curry you prefer. I will share two ways of making this kalmi shak bhaja with the same ingredients. And both are easy and delicious. There is a slight variation of taste. So do try both of the processes. And let me know which one suits you. Here I have used panch phodan. But if it is not available to you. You can also add nigella seeds/kalonji/black cumin seeds instead. Wash kalmi shak properly in running water and drain excess water. Finely chopped the shak and transfer into a pan. Now add salt and cook uncovered on medium flame until the extra moisture evaporates. Or it becomes dry. Stir in between. Heat mustard oil in another pan. Add panch phodan and broken dry red chili to the hot oil. let the panch phodan splutter. Add the chopped garlic. Followed by poppy seeds.Stir till garlic turns golden brown. Add cooked shak. Stir for some seconds and remove from flame. It is ready to serve. Serve hot. Finely chopped the shak and set it aside. Heat mustard oil in a pan/kadhai. Add panch phodan and broken dry red chili to the hot oil. let the panch phodan splutter. Add the chopped garlic. Followed by poppy seeds. Stir till garlic turns golden brown. Add the chopped kolmi.shak, and salt. Keep the heat on medium to low and let it cook until the extra moisture evaporates. Stir in between. Adjust the red chilli as per your taste. In both processes, cook the shak uncovered and do not overcook. It must be crunchy or else it will not taste good. In the first process, you just have to give the cooked shak a temper/tadka/chhonk. Wonderful to know its Indian name. I always followed water spinach and though it was available easily in Malaysia used to avoid it as the only thing i knew to make out of it was fritters. Now have a better option. Thankyou. I am a great fan of shaaks .. so nutritious. Love to eat them with bhakri. This recipe sounds quite similar to the dish we Sindhi's make known as Aisi palak,i.e.dry spincah. Love this. Yours look delicious. fantastic share Gitanjali. Must say this is super healthy and so easy to make. I loved this kalmi shak bhaja recipe. Bookmarking I am so tempted to cook it. Kalmi shak bhaja is quite popular in Bengali household. Your post made me nostalgic. I remember mom made Kalmi shak bhaja. Your looks so inviting. Great share. My grandma used to make this saag whenever we used to visit her here in Bangalore we hardly get this variety of saag, you reminded me of those days loved your recipe. Lovely share, now I need to get this green vegetable, it is new to me. I need to find more info about it , thanks for sharing. For me this is a new shak. Never heard of water spinach. I love the recipe can i try it with regular palak. A new recipe, infact a new Vegetable to me. Will find out what f can get hold of this veggie here. Thanks for the share. I love greens and this looks amazing. Water spinach is new and ill try to find if I can get one here. Addition of sesame seeds is interesting.